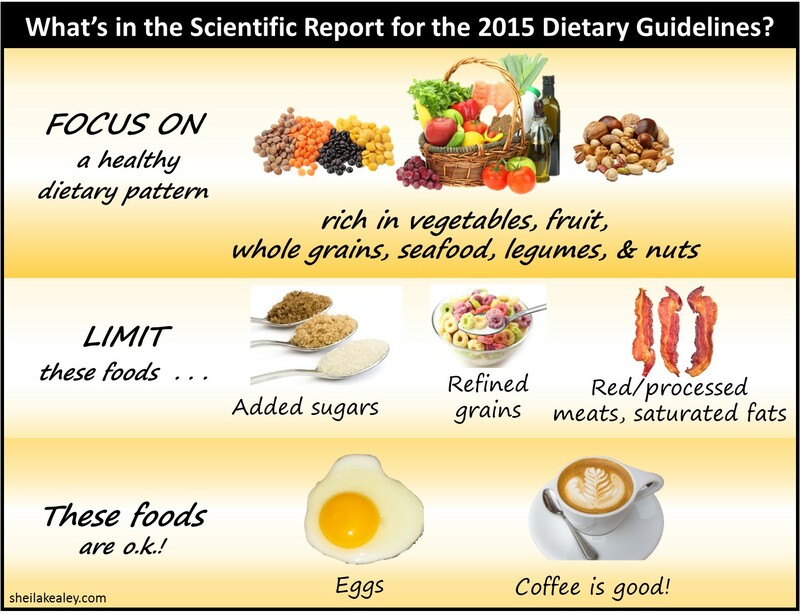 Did anyone notice that a couple of weeks ago new dietary guidelines were put out by the US government? Remember the pyramid from many years ago? Well I guess it was time for another update. I thought that it would be interesting to look at the history of their recommendations through the years. Vegetables and fruits: Recommended as excellent sources of vitamins C and A, and a good source of fiber. A dark-green or deep-yellow vegetable or fruit was recommended every other day. Milk: Recommended as a good source of calcium, phosphorus, protein, riboflavin, and sometimes vitamins A and D. Cheese, ice cream, and ice milk could sometimes replace milk. Meat: Recommended for protein, iron and certain B vitamins. Includes meat, poultry, fish, eggs, dry beans, dry peas, and peanut butter. Cereals and breads: Whole grain and enriched breads were especially recommended as good sources of iron, B vitamins and carbohydrates, as well as sources of protein and fiber. Includes cereals, breads, cornmeal, macaroni, noodles, rice and spaghetti. I vaguely remember learning about the 4 food groups in school. These recommendations hung around from 1956 all the way until 1992 when they finally revised their “Basic 4” into the Food Guide Pyramid. This revision was supposed to help Americans learn how much they should be eating by adding the serving suggestions next to each group. Interestingly, the first chart suggested to the USDA by nutritional experts in 1992 featured fruits and vegetables as the biggest group, not breads. But as the big interests groups in the grain, meat, and dairy industries learned about what the nutrition experts wanted, they lobbied the USDA, which is heavily subsidized by these groups, and the pyramid was changed. This was the beginning of the low fat, high carbohydrate diet trend that was so popular in the 1990’s. 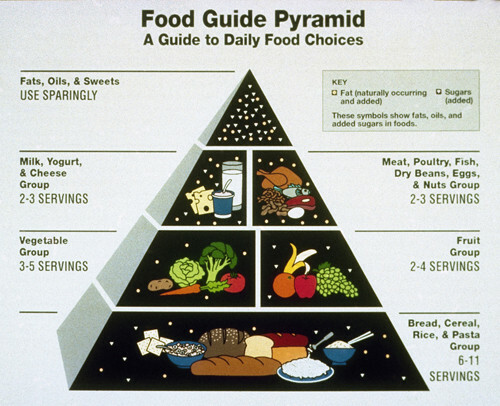 Louise Light, one of the original composers of the food pyramid warned that if Americans ate as the revised chart suggested, it “could lead to an epidemic of obesity and diabetes.” How right she was! It took until 2005 for the government to redo the pyramid again. This was a little too late because according to the CDC, in 2005, over 1/3 of all Americans were obese, that was 72 million people. The new pyramid added stairs to encourage exercise and let go of the hierarchical levels of foods, placing them more side to side in order to encourage an increase in the consumption of vegetables and fruit. Unfortunately this did not help the obesity rate in the US which continued to trend upward in adults and children. In 2014, the percentage of adults who were obese reached 27.7%. This was up more than two percentage points since 2008 and is the highest obesity rate Gallup and Healthways had measured in seven years of tracking it at that time. In 2013, more Americans who were previously overweight had now moved into the obese category, while the percentage who were at a normal weight remained stable. Unfortunately, children have not faired much better. These are some very disturbing facts. So, finally the government as decided to update their standards. The full report is available on the government website. The site explains all of the new guidelines. Here is a quick summary put out by Sheila Kealy. 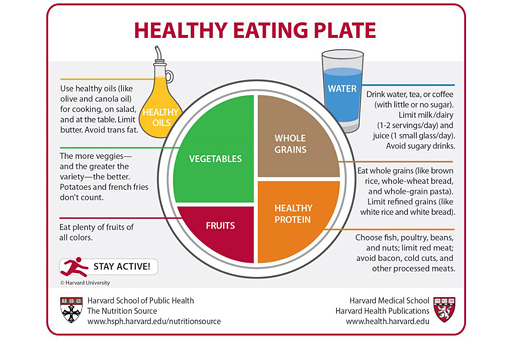 I like the way that this is laid out because it helps people to see what should be on their plate at each meal. On the Choose My Plate website, it will help people explore more in depth the healthy eating plate. Their are a lot of resources and information on this website to explain the guidelines in more detail. Accessible healthy food to underserved locations. Water intake instead of sugar-sweetened beverages. MARKETING of unhealthy foods to children. So, what do you think? There is a lot of information on their website but I am not sure how much people will see it or seek it out. I am curious to hear what you think about it. Will these new guidelines change the way that you eat? Do you already follow most of these guidelines and so are uninterested? Are they too simplistic? Let me know. I look forward to hearing from you! This entry was tagged 2015 dietary guidelines, 4 food groups, basic 4, basic 7, choose my plate, choosemyplate.gov, food pyramid, harvard medical school, Sheila Kealy.